On a drizzly afternoon, a small group of architects, designers and planners, led by officials from the city of Troy, took their first steps inside the long-closed Academy Street High School, near downtown. Very quickly, they began to see something far beyond the empty gymnasium and the dusty equipment and supplies stacked in the abandoned hallways. They saw – opportunity. “It’s a great building. 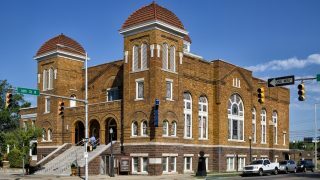 It’s got great structure, great bones,” said Brandon Bias, a regional and community planner with the Mobile office of Goodwyn Mills and Cawood Inc., an architecture and engineering firm. Bias serves on the board of DesignAlabama, a Montgomery nonprofit that supports communities through education and projects that advance community planning and design. Earlier this month, Bias was among the volunteer design experts who descended on Troy for the weekend through an initiative called DesignPlace. 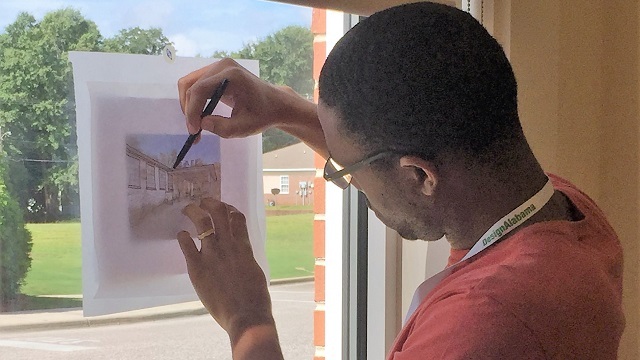 During the workshop, they met with local citizens and community leaders, toured the old school and started sketching – that is, literally sketching – ideas for new and creative uses for the old school and its extensive grounds. At the moment, the reality is empty school buildings, built in 1948 in what is known as the International Style. The simple, brick and concrete rectangular structures feature clean lines and lots of windows that provide plenty of natural light. In addition to classrooms, the main building sports an open auditorium that once served as a gymnasium. A second structure, built later, contains a larger gymnasium. A courtyard area between the buildings and old athletic fields at the back of the complex provides space for creative reuse. Another important facet of the project is the building’s history. Academy Street was Troy’s African-American high school until 1971, when the school system desegregated. It was constructed after fire destroyed the original building, built in the early 1920s. The first two-room school on the site served only two lower grades; it was expanded to become a junior high school in the late 1920s. In 1941, it officially became Academy Street High School. DesignAlabama helps officials see potential in Troy’s vacant Academy Street High School from Alabama NewsCenter on Vimeo. Troy Councilman Robert Jones, who participated in the weekend workshop, was among the last students to attend Academy Street. He spent two and a half years at the school before it closed. 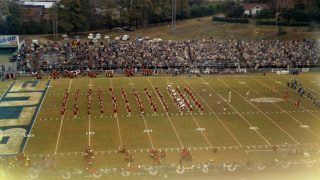 He and his classmates then transitioned to Charles Henderson High School. 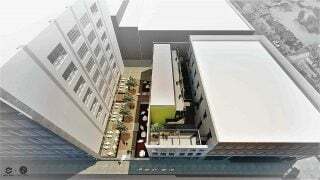 Jones envisions multiple uses for the redeveloped property, including vocational training. U.S. firearms maker Kimber Manufacturing announced earlier this year it would open a $38 million production facility in Troy, creating more than 360 jobs over the next five years. “We’ve got a lot of things going on in the city of Troy … new industry. We need to prepare people for those jobs,” Jones said. Gina Clifford, DesignAlabama executive director, said the Troy DesignPlace workshop had great local participation, including two community “Come and Go” events at the public library. The developing consensus from the discussions is to move forward on a multi-purpose facility that would offer classes for both young and old in the community. “In the architects’ sketches there are spaces for vocational learning for trades, such as welding and licensed practical nursing. Then there are art classrooms,” Clifford said. “The landscape architect on the team looked at the outside of the site and created some amazing ideas,” including a public amphitheater, teaching gardens, a walking trail along a creek and a playground. Clifford emphasized that the weekend’s work was “a start,” and the ideas presented would evolve as the city moves forward with revitalization. She said the next step in the DesignPlace process will be for designers to fine-tune their drawings and renderings, including a logo for the site. The refined product will be presented to the city in a report. At that point the city takes over, Clifford said, although DesignAlabama will continue to stay in contact with city leaders as they press forward and seek funding for redevelopment. Troy Mayor Jason Reeves said he is thrilled about the process and the ideas that are emerging. “I’m very excited about getting a lot of different disciplines involved to take a holistic approach, to find out the best ways to enhance this property. “For many, many years, it produced outstanding individuals through an education process. We want to get it again to produce something, instead of laying there as sort of a fallow field,” Reeves said. Councilwoman Wanda Moultry, whose district includes Academy Street, couldn’t contain her excitement about the possibilities. “This could be a powerful place,” Moultry said. The game, inaugurated in Montgomery, originally was planned to be at the New York World's Fair.